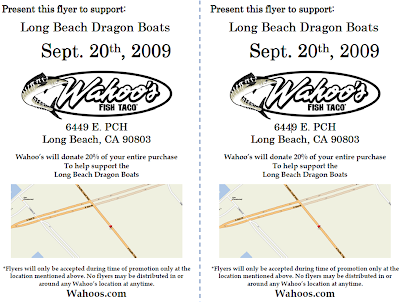 We are very excited to announce that our nearby Wahoo's has agreed to host a fundraiser for our Long Beach Dragon Boat community THIS SUNDAY (9/20/09)!! 3) Present the flyer when placing your order - that's it! Wahoo's will then issue a check for 20% of all purchases to our Dragon Boat community! Special thanks to our very own "Kitty" Kat for coordinating this fundraiser w/ Wahoos! Thanks to all Long Beach paddlers for supporting and spreading the word! We encourage you to distribute flyers to not only to your fellow paddlers but also friends & family! P.s., The ONLY rule Wahoo's has is: NO distribution of flyers in or around any Wahoo's location, before or during the time of the promotion. Failure to follow this rule can result in termination of the promotion. P.p.s., Space Dragons will have flyers at Mother's Beach this WED PM (9/16), Sat AM (9/19), & Sun (9/20). Say hello and grab some!